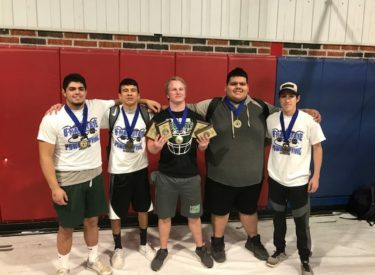 Tyrone took 5 guys to compete in the 8 man state powerlifting meet held in Sharon Mutual. Those 5 young men finished 4th overall as a team. State Champion in the 181 weight class was Brandon White! Brandon won outstanding bench, squat and deadlift for the heavy weight division. He also was named the top overall lifter in the heavy weight division. State Runner Up in the 123 pound weight class was Gustavo Favela! Finishing 5th in the 123 pound class was Alex Torres. Jonathan Corrales finished 3rd in the 220 pound weight class and Jesus Valles also took home 3rd in the Heavy Weight Division.